A visit to Tracy Arm Fjord allows you to enjoy all the sights from the comforts of your favorite view point on the ship. The views from the ship all thru Tracy Arm Fjord is very beautiful, peaceful and exceptionally relaxing. 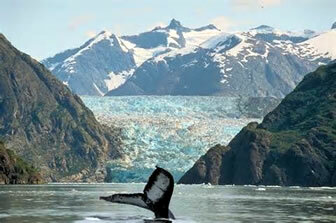 The entrance to Tracy Arm Ford is located about 45 miles south of Juneau Alaska. Tracy Arm Fjords is a rugged mountains coastline made up of steep inclines towering above lush valleys with cascading bridal veil waterfalls. During the summer, Tracy Arm Fjord has considerable floating ice ranging from the size of a three-story building to hand-size pieces. Day cruises are common from Juneau and cruise ships make regular calls to the deep waters of Tracy Arm Fjord. The twin Sawyer Glaciers, North Sawyer and South Sawyer, are located at the end of Tracy Arm. Large chunks of ice breaking off of Sawyer Glacier in Tracy Arm Fjord is common and a thrilling sight to see and to hear. 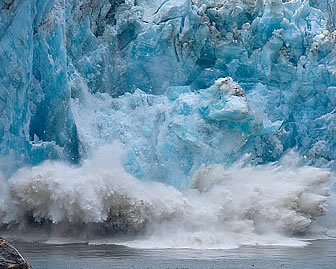 No visit to Alaska would be complete without the experience of seeing a massive tidewater glacier up close. If you're lucky enough to be there when the ice is calving your time will be embedded into your memory forever. Also See Endicott Arm and Dawes Glacier, the southern route of many Tracy Arms Cruises.